Our Ladybird Toddler Room is a gentle introduction to a more structured play offering a balance between child-initiated play and adult-led learning. We provide a relaxed environment with a variety of stimulating activities encouraging social, emotional and creative development through singing and music, mark making and physical play. 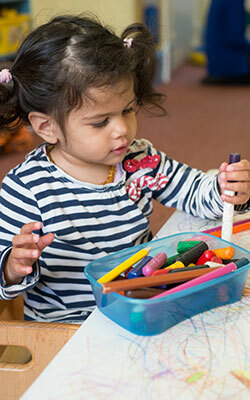 Each of our activities gives opportunities for learning including early mathematics and language development. The room offers free flow and there is a dedicated messy and creative room to give children freedom and choice to explore a variety of activities. Working closely with parents, we help with toilet training giving support and supervision to teach children to take responsibility for their own personal hygiene, and to emphasise the importance of hand-washing together with the independence of doing it for themselves. Each child has a key person and a daily diary will be completed by their key person to advise parents of their child’s activities and well-being throughout the day. Our Ladybird Room also includes their own dedicated nappy changing and toilet area for children who are ready to be toilet trained.